Absence makes the heart grow fonder, especially when applied to Prime Ministers, though for some, “fonder” refers to a transition from seething hatred to a slightly diminished level of seething hatred. John Howard has sensibly let a few years and a couple of other Prime Ministers telling lies and stuffing things up make us feel a bit wistful for the good old days when at least you didn’t have any false hopes left to be dashed. Sadly, John couldn’t leave well enough alone and he’s ripping the scab off this week, releasing the slightly disturbingly titled autobiography “Lazarus Rising”. The only good name for an ex-PM’s autobiography is “It Seemed Like A Good Idea At The Time” and it should contain an unconditional apology for pretty much everything, leaving Kevin extremely well-placed to get it right when his comes out (possibly serialised with subtitles in The Monthly). 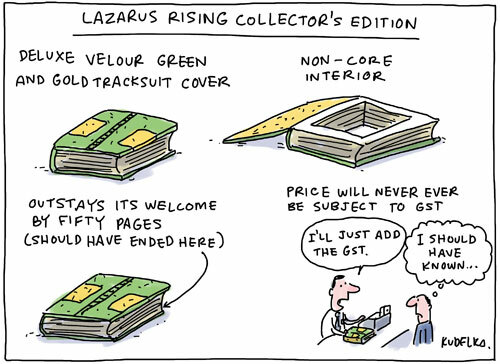 I strongly recommend you avoid reading Lazarus Rising and just let him stride off purposefully into the sunset, let’s face it, you really aren’t going to change your mind about the bloke either way. However, if you can’t help yourself, consider purchasing the definitive John Howard biography as an antidote, a bargain at $10 a throw. Shouldn’t it be $10 plus GST? The $10 version is far more honest! And contains bonus LOLs. Nope, $10 including bloody GST and postage and a lovely padded envelope. Just trying to spread the love rather than toss out the last couple of boxes. Hmm.. 711 pages for $10 verses a pack of 8 Sorbent Toilet Rolls. Still – it might give someone something to read before confining it to it’s obvious purpose. I’m not saying that toilet paper wouldn’t be a wiser investment, but I’m pretty sure we’re talking about a different $10 book.